description: A simple sheet metal box houses the transformer and wiring. 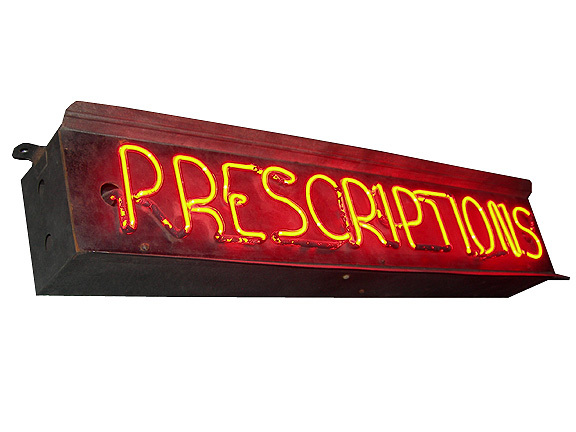 Masonite provides the face for this red neon "PRESCRIPTIONS" sign. A metal flange on the front of the cabinet protects the neon tubing from damage when it is hung against a window. information: Originally from a corner drug store at 8th and Russell Boulevard, located in the Soulard neighborhood, St. Louis, Missouri. Spring of 1974 Jim May from Purple Cow Antiques purchased the sign from the store owner on the last day of business after 70 years.